WHO? 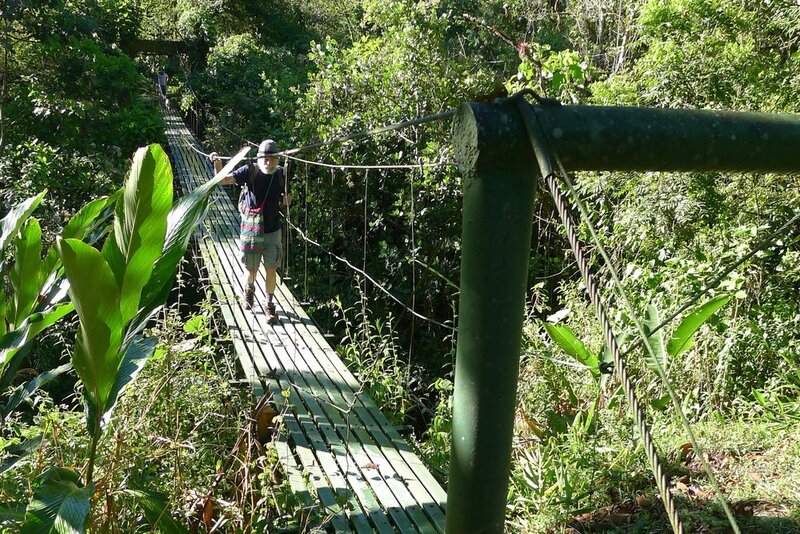 - We are a US family who has been offering camping on our 200 acre mountain of rain forest since 1974. You will be camping deep in the Talamanca Mountains beyond the reach of electricity. Because our reserve is remote and hard to find, it is a magical experience, like living in a time warp. You'll see that people here live as their great, great grandparents did one hundred years ago, except that they now have one solar panel which enables them to charge their cell phones for more pictures! There is no internet service on The Reserve. The campers who have paid to stay here have all contributed to keeping the jungle alive and growing. Your dollars are all used for keeping the reserve protected and for paying salaries to local people, making their lives better. Our former names were: Talamanca Treks, costaricabackpacker.com, www.geocities.com/vereh_ecotourism, and Camping San Augustin. David lives on the camp grounds full time and can help you with all of your needs. You must cross this hundred foot bridge to access the campgrounds. Rio Vereh Borders The Front Of The Mountain Reserve. From March 8-15, 2019, Mark, Sarah, Kate, Darshan, and Karine will be camping. This would be an excellent time for anyone else out there to come and enjoy a wild adventure. February and March have the best weather so we are only open in those two months. If you want to camp in other months it may be possible with advance notice and reservations. Email me at sharycamping@gmail.com. Payments can be made through PayPal. A new composting toilet (out house) has been completed. We hope you will enjoy the beauty of the bamboo privacy and surrounding gardens. An improved trail to the waterfall and water source is being designed. Construction of the trail will be on going. Campers are using the kitchen and shower in the main house at present. nonprofit to protect the rain forest and give employment to local and indigenous people.